ONLY AVAILABLE FOR SMALL FAMILIES: GROUPS UNDER 30 YEARS OLD ARE NOT ACCEPTED. 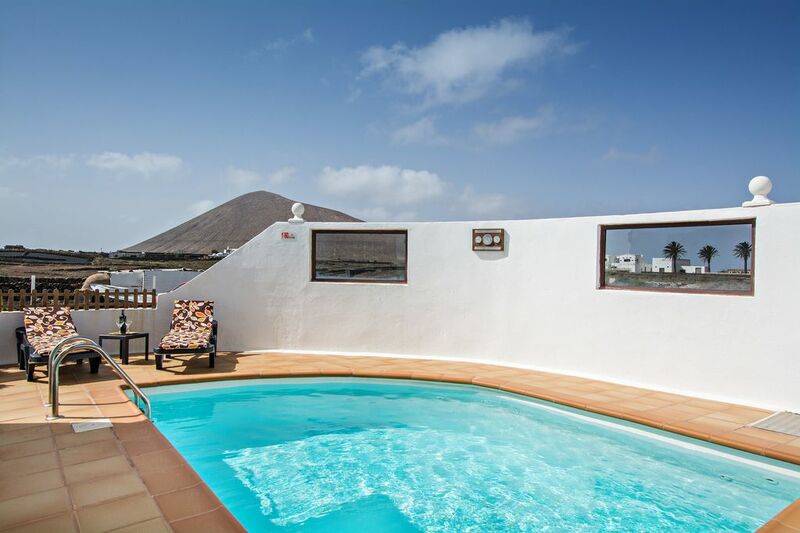 Nestled in the tranquil landscape of central Lanzarote, situated on the outskirts of the town La Vegueta, Villa Makecica welcomes guests with its cosy atmosphere and beautiful pool area. The charming holiday home with beautiful paintings is particularly ideal for families and consists of a living/dining room with a sofa bed, an integrated, very well-equipped kitchen, an additional indoor lounge area, one bedroom as well as one bathroom and can therefore accommodate 4 people. Additional amenities include Wi-Fi, cable television, a baby cot and children's bed. Outside on the fenced property, you can sunbathe under the blue sky in complete privacy and take a refreshing dip in your private pool. Admire the beautifully-landscaped garden in Lanzarote style, with volcanic rocks, plants and charming statuettes. In the evenings, you are invited to prepare delicious meals on the barbecue and enjoy a glass of wine on the unroofed terrace, which is equipped with a small table and a lounge area. You will find supermarkets as well as a limited selection of shops and restaurants within a 5-minute drive from the property, located in the small towns that border on La Vegueta. The stunning natural sights of Lanzarote, including the enormous Los Volcanes Natural Park and an impressive crater are a 6-minute drive away and some of the island’s most popular, sandy beaches are located about a 23-minute drive away in Puerto del Carmen. Here you can relax on the sandy shore and listen the calming sound of the ocean. Parking spaces are available on the property. Bed linens and towels are included in the price. No parties are allowed. Additionally, one extra bed can be provided for an adult upon request and for an extra charge - this is to be discussed with the owner. The owner does not accept daily visitors or extra guest at the property.